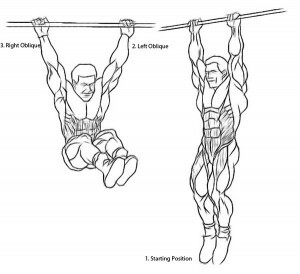 Starting Position – Hanging from bar with hands spaced about shoulder width apart, toes pointed down, abs flexed and make sure you are looking up. Slowly raise legs up toward your left hand with legs straight and knees locked. Keep your legs straight for as long as possible. If you have trouble doing this make sure you do a lot of stretching exercises before your workout. You will slowly be able to keep your legs straight through the full motion of the workout as you become more flexible. After returning to the starting position from step two raise your legs in the same manner toward your right hand. Return to the starting position and repeat. Do 4 or 5 of as many reps as you can handle. This exercise is an advanced workout that may take months to be able to do. If this workout is impossible for you then try it with your knees bent and work up to doing it with straight legs. Never swing your body but always maintain a motionless core. – To really feel the burn in your upper abs while doing this workout, contract your abs, like your doing a crunch or sit up, when your legs are in step one or two, pointing your toes to the ceiling. Basically it’s like doing a hanging sit up while alternating sides. This entry was posted in Abbs and tagged Abs Workout, External Oblique, hanging leg raises, isolation, upper abs by Russell Jensen. Bookmark the permalink. I want to apologize to you, Joe, and everyone else that reads my blog. I am working on getting more content. I do have another site http://www.exercisesandworkouts.com and it will have EVERYTHING I do in my daily workout routine. I managed to mask my pectus by doing a lot of different workouts i.e. I work out legs a lot because when you do leg exercises it releases testosterone in your body and makes it easier to get a big chest and abs… this stuff will all be covered on the exercises website. I am working on combining carinatum.com and exercisesandworkouts.com.